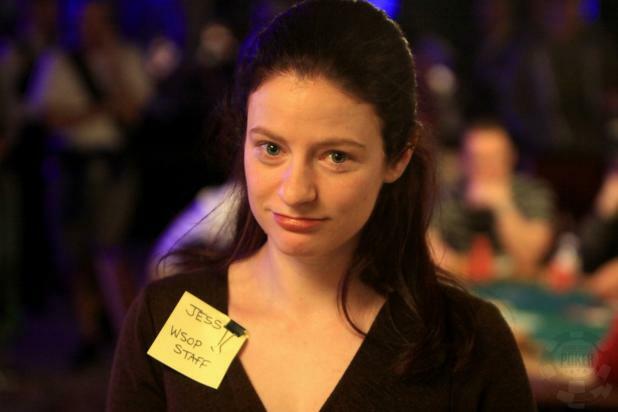 WSOP.com Managing Editor Jessica Welman can't seem to find her name badge. Luckily, the crew in the media room were quick to hook her up with a replacement. 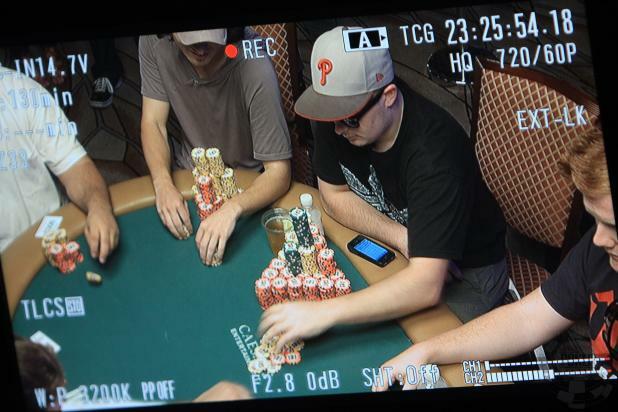 The ESPN camera crew keeps an eye on the big stack, Paul Volpe. 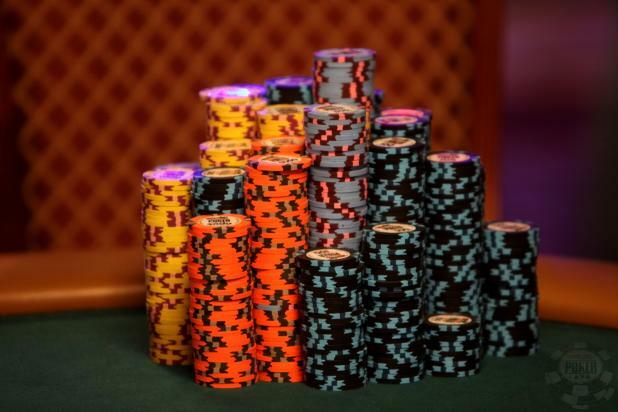 He began Day 5 as the chip leader with 2,750,000. When Andras Koroknai's table broke, it took his tablemates just a minute or so to gather their chips and head to their new seat. Koroknai needed more than just a minute to rack up his gigantic stack though. He comes into Day 5 seventh in chips with 1,971,000. The ESPN camera crews keep an eye on Phil Collins as he waits to be escorted to the payout desk after busting. 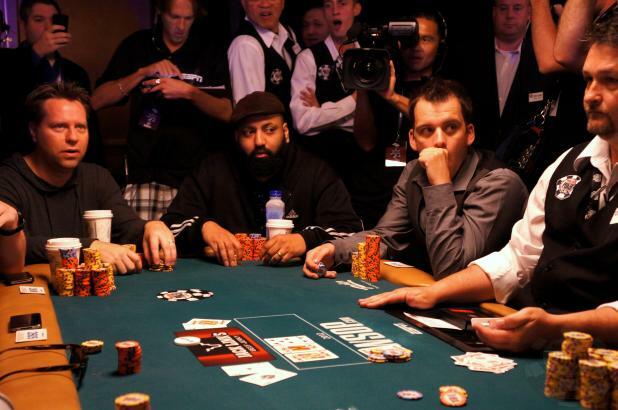 Collins, who was a member of the 2011 November Nine, cashed this year in 393rd place and will have to wait until 2013 for another shot at the Main Event final table. 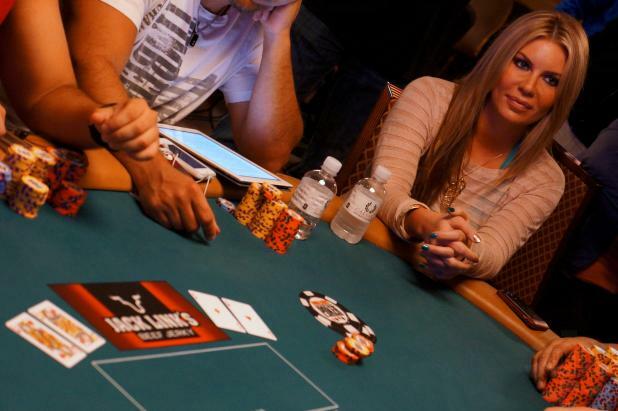 Christina Lindley waits patiently for the ESPN camera crews to arrive after getting it all-in holding pocket aces to David Kelley's pocket queens. Lindley had Kelley covered, but only by a few thousand chips. Her aces held and she made the money, while Kelley was one of four players to burst on the money bubble. 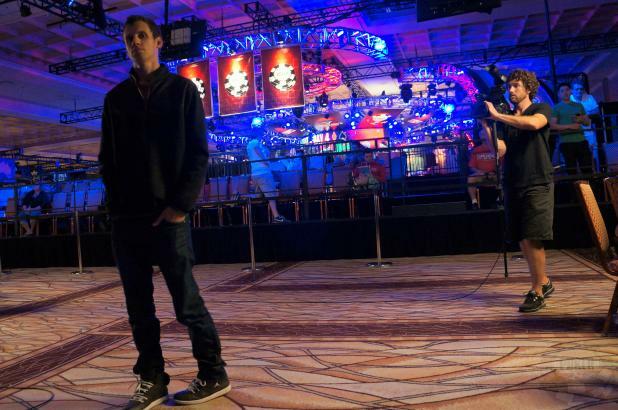 As Tournament Director Jack Effel moved to each of the five tables with all-ins on the money bubble, a crowd of media, ESPN crew, dealers, and players followed. While Dane Lomas and Devin Looney aren't pictured in the photo, their cards are, as well as the reaction it elicited when Looney's A-K managed to flop trip kings to eliminate Lomas, who got it in holding pocket aces. Dan Shak gets all-in on the turn holding K-7 against his opponent's pocket sevens on a K-J-6-7 board. However, the miracle king of clubs falls on the river, giving Shak one of his two outs to make a better full house and a double up on the money bubble. 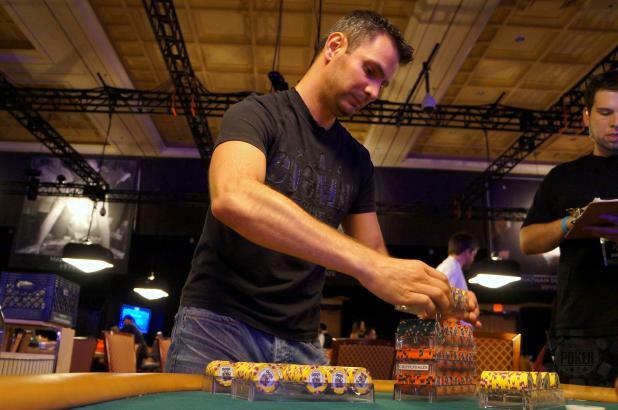 After dinner break, Ben Alcober looks to be the chip leader with close to one million chips. Any yes, we know he has a dirty stack of 5,000 chips. 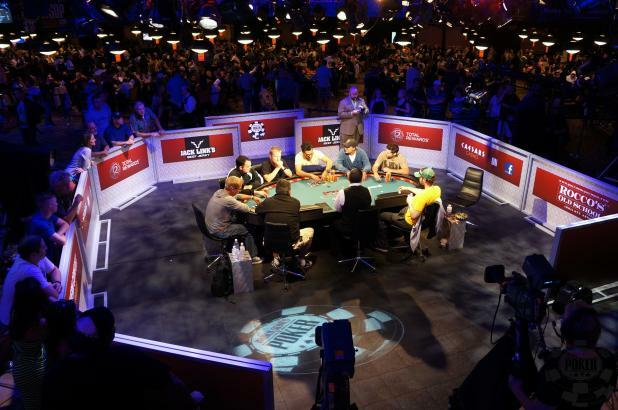 On Day 3 of the Main Event, the ESPN Secondary Feature Table has been put to use. 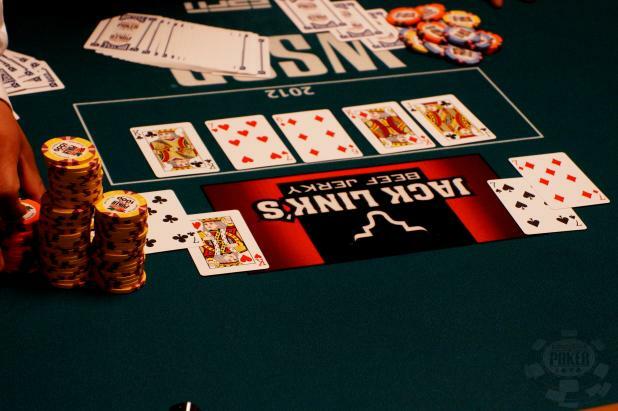 The current line-up includes the likes of Silly Bandz creator Robert Croak (seat 2), Big One for One Drop winner Antonio Esfandiari (seat 5) and the voice of the WSOP live stream, David Tuchman (seat 7). 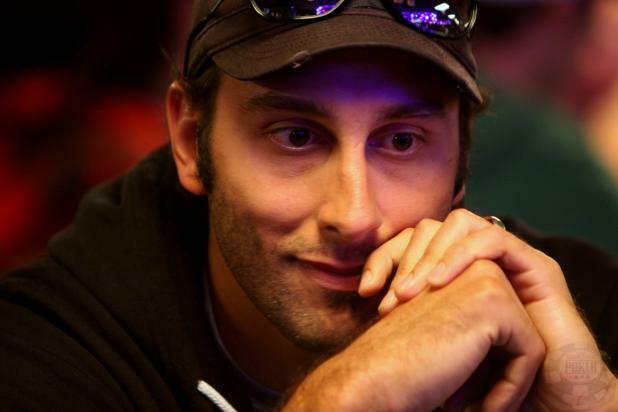 The NHL season may be over, but goalie Roberto Luongo is still getting plenty of playing time in the 2012 WSOP Main Event. Now on Day 3, Luongo is looking to extend his run into the money and beyond.